The TimeTracking / Transaction table always return null/ no rows as a result. Tried to reset QODBC optimizer, but doesn't work. Please update your QuickBooks to latest version & check issue again. Also, please make sure that short date format in Regional Setting is not set to “yyyy mmm dd”. If your short date format is “yyyy mmm dd”, then you might face this issue. We have received multiple reports about table TimeTracking not returning any data, and we found that this is usually caused by Corruption in Company file. To locate your issue, please test the same query on another company file, such as sample company file, to see if it can bring data back. Also, try adding limiting the result set by adding filters and apply date range. If the same query can bring data back to other company files, then please try to rebuild your company file via File->Utilities->Rebuild Data in QuickBooks to see if it can fix your issue. And if rebuilding does not work, please contact Intuit for more help. And if QODBC cannot extract TimeTracking/Transaction data on other company files, please post a ticket to us so that we can do a further investigation on the issue. I've spent the past day doing the following: 1) confirming that time tracking returns records from another company file, 2) File|Utilities|Verify Data on the problem company file - no problems, 3)File|Utilities|Rebuild Data (anyway) on the problem company file - still no TimeTracking records, 4) Cleaning up data to 12/31/2010, 5) Creating and restoring a portable company file, 6) updating the company file from v11 to v13, and finally, 7) running File Doctor. I do not think the problem is related to corruption in the company file. Did everything you suggested above. Still no access to the time tracking table. 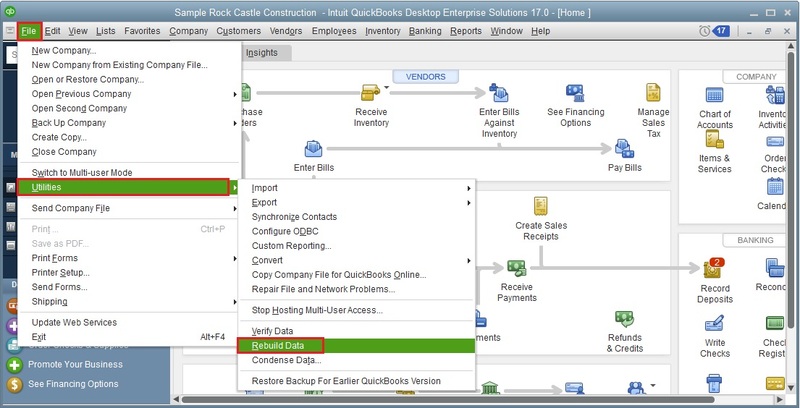 Same problem here running QuickBooks 2013 and QODBC 13.00.00.291. Nobody seems to have solved this issue. If you are not getting data in QBResponse.xml, then you have to contact Intuit. I would like to inform you that SDKTestPlus3 is a test tool from Intuit. You can download it from Intuit's website. SDKTestPlus3 does not use QODBC, SDKTestPlus3 & QODBC uses QuickBooks SDK to connect to QuickBooks. If QuickBooks SDK or QuikcBooks is having issue, SDKTestPlus3 will also fail. My Timetracking Transaction Table is blank. I thought it was an excel issue so I bought Access and still no luck. I did a rebuild and everything is fine. Not sure how to get the information to work.